On Oct. 24, 2018, Pennsylvania Gov. 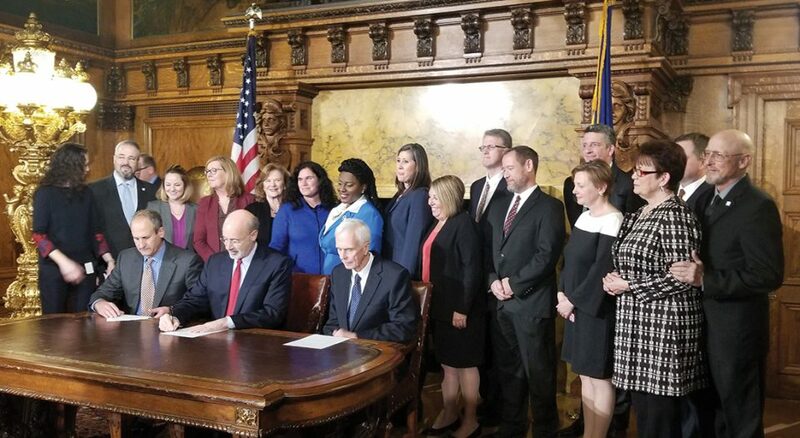 Tom Wolf (seated center) signed the Safe Harbor bill into legislation. The bill provides funding for rehabilitation services for victims of human trafficking. When it comes to helping shape our world to be more fair, more just and more compassionate, Christians have achieved much. By raising our voices to ask for policies that help others, advocates bring a welcome voice of conscience and reason to the public sphere. Download a study guide for the article “When disciples use their voice,” which looks at how advocacy leads to new legislation. The pdf includes four pages of study questions and a copy of the article.